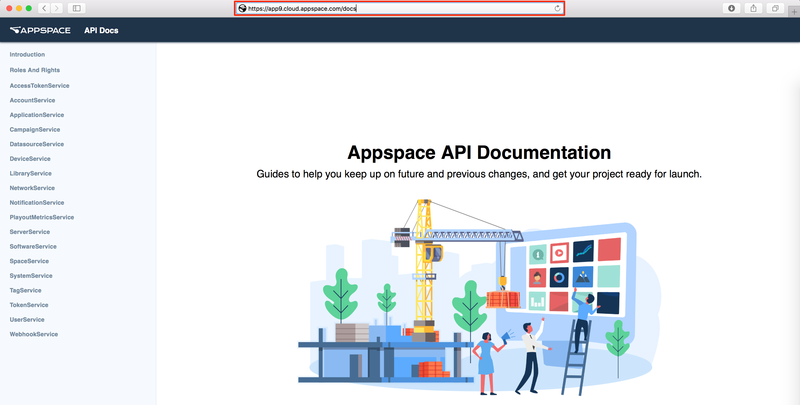 The Appspace API (Application Programming Interface) library provides developers access to a collection of APIs modules that are built on WCF (Windows Communication Foundation), a framework for building service-oriented applications. To access the API library, you need to go to https://[server].cloud.appspace.com. Follow the instructions below to find the URL. Log on to your Appspace console, and identify your Appspace cloud server URL. To access the Appspace API library, append /docs to the URL above.